(Nov. 10, 2014) -- At the Sarabia Family Counseling Center, the UTSA neurofeedback training program is teaching graduate students how to control the brainwaves that are linked to certain mental health conditions, including anxiety, Post Traumatic Stress Disorder and Attention Deficit Hyperactivity Disorder. According to the National Institute for Mental Health, anxiety disorders affect about 40 million American adults age 18 years and older every year. When these disorders are triggered, abnormal or overactive brainwaves can be seen on computers via sensors used in neurofeedback techniques. Using this feedback, specialists trained in the technique, including UTSA graduate students in training at the center, can provide treatment options that "calm" the brainwaves to a normal level and reduce symptoms. The technique also can be used to treat overactive brainwaves from other disorders such as PTSD and ADHD. Led by UTSA lecturer and adjunct professor Mark Jones, the UTSA neurofeedback program is the only one of its kind in the nation accredited by both the Council for Accreditation of Counseling and Related Educational Programs and the Biofeedback Certification International Alliance. In the board-certified program at UTSA, cohorts of about 12 students take part in extended laboratory courses that provide services to about 15 clinical patients a week. Treatment options to help control the brainwaves include cognitive therapy or other brain-calming exercises. "From the student perspective, it's a really awesome opportunity to be in a groundbreaking program," said Michael Russo, a UTSA graduate student. "Combining technology like this with traditional counseling helps a vast amount of clients." The program has been a part of the Department of Counseling in the UTSA College of Education and Human Development for three years. Before treating clients, students have the opportunity to receive their own neurofeedback. Placing 19 sensors on each other and reading their own brainwaves helps them to not only learn the process, but better understand clients. "We all have 'issues,' so to speak," Jones said. "This helps students become comfortable with their own anxieties and empathize with clients and what they're going through." 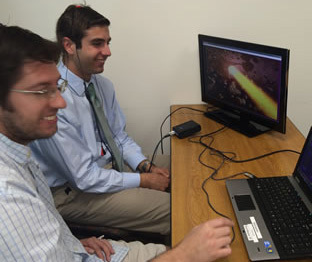 Neurofeedback services are provided free of charge and are performed by students under the supervision of Jones. Free counseling services also are available at the Sarabia Center, and often a combination of neurofeedback and counseling can increase effectiveness. Learn more at the UTSA Sarabia Family Counseling Center website.